Financial reporting is the process of producing statements that detail a company’s financial status. 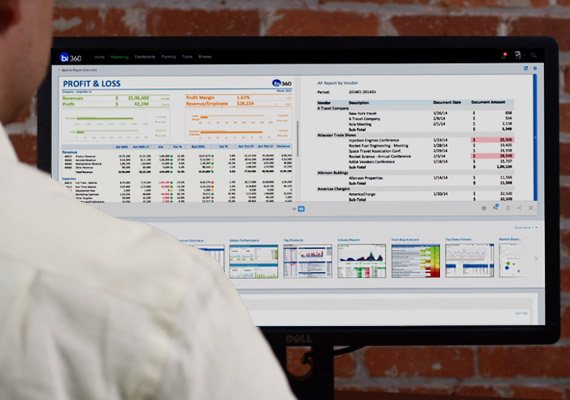 A financial reporting tool enables the user to build customized reports that use transactional information from one of your data sources, integrating live from Sage 100, a data warehouse, an online analytical processing (OLAP) cube, or for example, a Customer Relationship Management (CRM) software. Most enterprise resource planning (ERP) systems have built-in reporting functionalities, but there are third party tools that you can invest in for more powerful, modern, and business user-friendly reporting. Independent software vendor (ISV) solutions allow finance departments to create report templates that provide easy and accessible analyses for company leaders, for smarter decision-making about the future of your organization. When it comes to accessing your company’s data, it will be important for you to explore options such as Excel, web, mobile, cloud, and/or proprietary interfaces. When looking to invest in a report writer, how you integrate to your data is very important and a foundational element when it comes to making business decisions. You will want to see which is more beneficial for the specifics of your organization. For example, if you are running reports live from Sage 100 or if you are integrating with a data warehouse or an online analytical processing application (OLAP) cube. Integrating live from Sage 100 means that you will have access to real-time analytics, right from the ERP system. More particularly, you will not have to ensure that your organization information is replicated to a data storage before you access updated data information. If you decide to develop and manage an OLAP cube or choose to go with a customizable data warehouse, you will have to invest more money into the data storage technology as well as integration and configuration. However, depending on the number of users and the size of queries in Sage 100 for reporting and financial consolidations, a separate data storage and integration is recommended for high performance. Reports can usually run with different parameters, such as period and department, which will allow end users to view data all at once by simply clicking on an option. One interesting analogy that BI consultant, Seung Yoo, gave me had to do with farmers and how they used to cultivate farm crops with their bare hands. Report writers such as Solver’s BI360 and Biznet represent the farm machines that can plant, grow and harvest crops by simply driving over the land and eliminating any room for human error. Some Excel-based report writers also provide a live integration to Sage 100 and other ERP systems, while many third party options exclusively integrate information for reporting from a separate reporting database. You should also be considering the type of platform that will work best for you and your organization to design reports. If you have Excel experience, you can imagine report writing as a way to automate reports based on end user selection. Users no longer need to rely on Excel to view and process financial data, but they can create a report that can be dynamic enough to report whatever they need without doing additional work. Excel-based reporting tools are simply an add-in tool that enhances Excel’s spreadsheet function with features that zoom in on secure collaboration and accounting logic. Some report writers are Excel add-ins, providing Excel users a head start on learning the reporting module, and there are no manual Excel reporting issues involved. On the other hand, some third party manufacturers have created proprietary interfaced report designers for those who argue that Excel is not secure. Other platforms such as the Internet and Cloud computing have been all the rage as they are the present and future of Business Intelligence (BI). Web- and Cloud-based solutions enable users to securely access data from anywhere as long as users have an internet connection. Companies can create and run reports online, inviting the necessary collaboration into the process because of modern technology. Keep in mind that Cloud reporting solutions almost always grab data from data warehouses or OLAP cubes, therefore real-time reports are not an option, but there are Excel-powered, web-based report writers. Web reporting works best for organizations that are structured similarly, particularly where remote personnel are regularly connecting to the company’s network out of the office. Internet-based platforms are extremely convenient and accessible, but you want to make sure that it is easy to use. Adaptive Insights and Host Analytics are proprietary, Cloud platforms, but BI360 is a hybrid solution that empowers business users to either run reports in Excel, through a web portal, or on a mobile application. To improve your Sage 100 experience, you should familiarize yourself with what features and functions would help solve your business problems when looking for the best financial reporting solution for your specific BI needs. This entry was posted in BI360, BI360 Reporting, Business Intelligence, Sage 100 and tagged Adaptive Insights, BI Solutions, BI360, BI360 Reporting, biznet, business intelligence, Cloud, Crystal Reports, data warehouse, excel, financial reporting, Host Analytics, jet reports, OLAP Cubes, report writer, Sage, Sage 100, Sage 100 report writer, Sage Business Intelligence, Sage Intelligence, SSRS by Hanna Kim. Bookmark the permalink. I am a digital marketing professional and sometimes other things (event planner, cook, songwriter). I am a Los Angeles native who loves to travel, stay active, and get to know people. I received my Bachelor’s degree in Communication Studies and Public Relations at Chapman University. I enjoy being silly, spending time with my loved ones and cooking for them.